I am afraid that last night’s game is the coup de grace on the season. To defeat Lowell twice there is a task we can not perform as much as I like this team. Going back to the Championship game last year, the ties to Providence, the tie with BC, the Beanpot, we can’s get that one goal. I believe that one of the reasons is that we don’t have ANY natural goal scorers. Time and time again we see this team and especially last night, get position on the goalie and just push the puck right at him. We NEVER deke out the goalie, EVER. Only natural goal scores have this ability and we have none. That does not mean we can not win but makes it very hard to do so. Arent they playing UMASS AMHERST? Two of our top six forwards have 0 goals in the month of FEB and another has 1. Lets hope they can find themselves in MARCH. We will play UMass Amherst in the first round but if we get by them we will play UMass Lowell in the second round. A good effort with a poor result. Certainly not the season that anyone expected, considering the elite talent level. By bye is tough to accept but reality has to set in that the A plus talent yielded C plus results. The good news is that a long playoff run is still a possibility. However there are many stumbling blocks to overcome. UMass has nothing to lose and if B.U. is still sulking after this week then the season will end a lot sooner than expected. If they move on they play a tough as nails team that seldom loses at home. Not impossible but certainly the underdog. If the reach the garden then most likely B.U is in the tournament. If not in my opinion they don’t deserve to be in but might have an outside shot. Not a pretty picture but reality. Someone please check lost and found at Agganis and look for a power play that was last seen mid January. JFK looks lost. if i hear one more time the comparison to Patrice Bergeron….. I feel your frustration and disappointment. There is no sllver lining playing UMass in a half filled arena with the students on spring break. I hope it is not a trap game. Nobody to blame but themselves. If they had beaten a few of the have nots of Hockey East earlier in the year (Vermont, Merrimack, UConn) they would have finished at least fourth. Team underachieved in the regular season but still have a chance to change that perception by making a strong playoff run. An NCAA tournament appearance is still a real possibility. Larry, while a win against any of those opponents would have indeed done the trick, I would say that the February 19th tie against UNH is the game that really made this all happen. Those three games you mentioned were last semester and the team hadn’t really hit its stride (especially Maguire). We came back and took the lead over the Wildcats that night … and only had to hold the lead a few minutes … but it was not to be. That, to me, was the game to which I look back with the most regret … by far. Anyway, we have a clean slate now and control our own destiny. 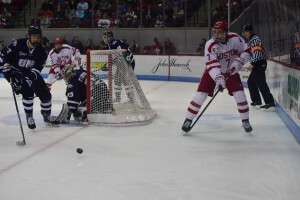 Positive thoughts and wishes for BU Hockey to go far this spring! I agree with you! The UNH game felt like a loss. Three mental mistakes on one play after taking the lead moments earlier is inexcusable! Especially at this level. A bad turn over, nobody blocked the shot and the defenseman never lifted the opposing players stick. That was a tough loss combined with the Lowell win over BC….OUCH! The boys looked good out there but just couldn’t get the job done. I agree Walter, goals at certain times are VERY hard to come by with this group. I find myself grumbling when they constantly shoot directly at the goalie. Well, onto Amherst….hopefully 2 and done!! I agree with Walter above as to the ability to score goals. This is a hard working team but don’t have the natural scorers. Getting two wins at Lowell would be harder that winning two in the Garden I would think. I bet there will be less than 1000 at the games this weekend. Stupid format for sure. Looking a bit wistfully at the 33 points Max Letunov put up with a mediocre UCONN team. Could he have produced 50 points at BU? Sure could have used it this season. A totally different regular season especially on the power play! The lack of offensive production the last 3 weeks is a red flag. The 2nd line (and Lane in particular) has gone cold. Cloonan still hasn’t scored since 1st half of the season. This puts too much pressure on the top line & Ahti to score. One thing they haven’t done as much of, or at least have been consistent about this season, is going to the net hard. Last year I felt they were constantly attacking the net area with speed and there was a consistent net-front presence in many scoring opportunities. They’re hanging out a bit much along the periphery and not getting as many 2nd/3rd chances that are often needed to score goals. Now that we’re in the postseason there’s little/no margin for any goal scoring droughts. Even with Maguire playing great they need to consistently score 3+ each game. I’m not particularly concerned about it this weekend, but assuming they take care of UMASS and advance, the lack of offense will be problematic as they face better competition. Can someone please explain Pairwise to me? We are tied for 9th and I get if you beat weaker teams it doesn’t count as much but why wouldn’t BU make the NCAA? Don’t the Top 16 make it? If we beat Umass we go down that much? Yes, Friend of BU Hockey. That one player could have made the difference. Saw Bellows last night for U 18 and he looks like the player who could have made us better vis a vis pure goal scoring. Wonder if he could have come at the break to help us out. ??? It’s not going to be easy to win on the road. But this team can do it. Matt lane has been a bright spot all season, and throughout his matriculation at bu. Make no doubt about it Matt will be ready for the playoffs. Like coach said these kids are hockey players they get to play more hockey. I’m ready for more hockey. I love this team and the senior class can’t wait for the post season to start go bu??? I agree the senior class has done its job. It is the rest of the team that has been inconsistent. One game they look like world class players. The next game recreational league players. Evan within a game they sometimes lose focus. It is very frustrating as they should have better results considering the talent level. Folks the quicker we realize we did not get the bye, lutnov a great player choose to play somewhere else. Spring break is this weekend and we will have to go to Lowell after beating u mass this week end the better off we will be. Support this team for who is on it. For the work they put forth. They can do it! I don’t care if I’m the only guy in the stands I would not miss this weekends games for the world. And as for traveling who cares I would go to a meat locker in Mexico to watch them. Lowell bc providence all tie their-skates the same way we tie ours. On any givin night this team can beat anyone. Let’s get ready for playoff hockey? GREAT perspective Colin!! GO BU! !